Military personnel and their families make great sacrifice in safeguarding the lives of American citizens. 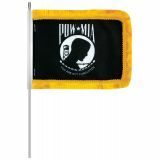 Tuff Flags is proud to help you to show your respect to the soldiers with our selection of POW MIA flags in various models and material choices. Apart from single and double sided POW flags, we have POW flag lapel pins and POW/MIA embroidered patch that poignantly illustrate the sacrifice of the military personnel. 100% Made in USA, POW/MIA flags are there as a constant reminder of of America’s missing soldiers and will reiterate that our missingheroes are never forgotten. Shop right away and find best prices, quick shipping, and much more! 100% customer satisfaction guaranteed! The POW/MIA Flag is the only flag to permanently fly over the White House other than the national flag where it was displayed for the first time in 1982 on National POW/MIA Recognition Day. 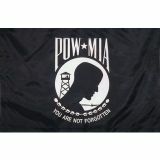 Show your pride for these brave soldiers who have been missing in action or have become prisoners of war with Our POW/ MIA flags, available in polyester and nylon fabrics, both look great both outdoors and indoors. 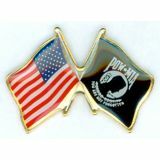 Honor our POWs, MIA and veterans with these specialty flags, patches or pins from us. We offer a wide range of sizes in POW flags that range from small flags which is perfect for your desktop to jumbo flags that are ideal for large governmental facilities. Be it on a stately flag staff at a home or business or flying at the local Post Office, these POW/MIA Flags are great as a reminder of our losses and this special group of military who deserve to be remembered indefinitely. Made from the finest materials and designed with perfection, these flags are indeed the pride of every American! 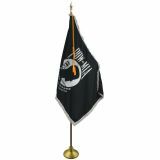 Browse our collection of POW/MIA Flags offered in various sizes and models. Should you need any tips or shopping assistance, call us at our toll free number (888) 287-3524 or email us at customercare@tuffflags.com and we can easily walk you through the ordering process.